The creation of the Universal Healing Tao System has evolved over the last fifty-five years from Taoist ten thousand year old formulas. Master Chia's research and training from his initial Taoist Master Yi Eng in Hong Kong 1957 and countless other Taoist and Buddhist Masters perfected and structured over hundreds of Taoist Inner Alchemy formulas for the transformation of the physical body into the spiritual body and the ascension beyond the North Star which is the attainment goal of all the Taoist Inner Alchemy practices. This system can be easy defined by its Four Inner Alchemy Healing Arts of the Living Tao, Chi Nei Tsang, Cosmic Healing, and the Immortal Tao. 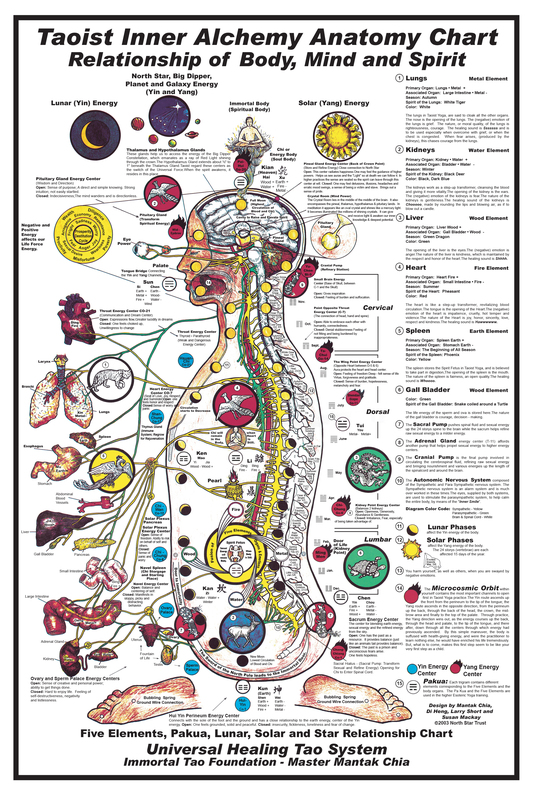 Each Healing Art focuses on each one of our bodies (Emotional, Physical, Energetic and Spiritual) with the intention and location of its practice; they are sub-divided into levels of understanding (Microcosmic Orbit I, II, III; Iron Shirt I, II, III, IV; Healing Love I, II, III, IV, V; Fusion I, II, III, IV; Tai Chi I, II, III, IV, V, VI, VII; Cosmic Astrology I, II; Chi Nei Tsang I, II, III, IV; Cosmic Healing I, II; Kan & Li I, II, III; Immortal Tao I, II, III) with supporting formulas within the sub-divisions. The Living Tao (Emotional Body) can be practiced in our normal living environment with family, business and religion. You do not have to leave your normal life, creed, occupation or family. The Tao is not a religion; it is a practice of individual self-discovery so whoever you are, you can be that just better at it. The Tao is how the river flows, how the sun glows, how the wind blows, how the tree grows, and how a seed becomes a rose. It is in everything that moves or does not move. The only way to understand the Tao is to feel it. The only way to feel it is to practice it and the only reason you practice the Tao is because it feels good. The Taoist practices teach you how to breathe, sleep, urinate, defecate, sit, stand, walk and exchange sexual energy in harmony with the natural flow of the universe. Every function of your life is affected: how you see, taste, hear, smell and feel. The Universal Healing Tao System shows you a step-by-step process to achieve these daily human activities through its Taoist formulas. Everything starts with a thought and that thought is an energy vibration that energetically manifests everything in the universe and our lives.